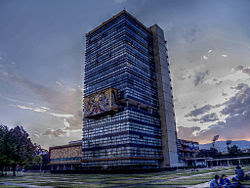 The National Autonomous University of Mexico (Spanish: Universidad Nacional Autónoma de México) (UNAM) is a public university based primarily in Mexico City and generally considered to be the largest university in Latin America in terms of student population. Founded on 22 September 1910 by Justo Sierra as a liberal alternative to the Roman Catholic-sponsored Royal and Pontifical University of Mexico , it is the only university in Mexico with Nobel Prize laureates among its alumni: Alfonso García Robles (Peace), Octavio Paz (Literature), and Mario Molina (Chemistry). UNAM's autonomy, granted in the 1920s, has given it the freedom to define its own curriculum and manage its own budget without interference from the government. This has had a profound effect on academic life at the university, which is known for its academic freedom and independence. Besides being one of the most recognized universities in Latin America, it is one of the largest and the most artistically detailed, being its main campus a World Heritage site. 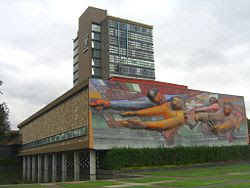 It was designed by some of the best Mexican architects of 20th Century and the murals in the main campus were painted by some of the most recognized artists in Mexican history, such as Diego Rivera and Siqueiros. 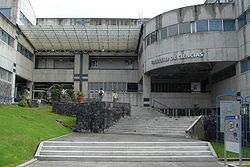 The university was founded on 22 September 1910 by Justo Sierra, then Minister of Education in the Porfirio Díaz' regime, who sought to create a very different institution from the its 19th century precursor; the Royal and Pontifical University of Mexico, which had been founded on September 21, 1551 by a royal decree of Charles I of Spain and brought to a definitive closure in 1867 by Benito Juárez and his fellow Liberals. Instead of reviving what he saw as an anachronistic institution with strong ties to the Roman Catholic Church,he aimed to create new university, secular in nature and national in scope, that may reorganize higher education within the country, serve as a model of positivism and encompass the ideas of the dominant Mexican liberalism. 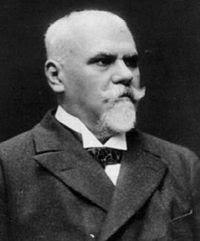 In 1881 Justo Sierra presented a National University creation plan for the first time, but it was rejected; his idea was to merge all major schools in Mexico in order to create one National University of Mexico. 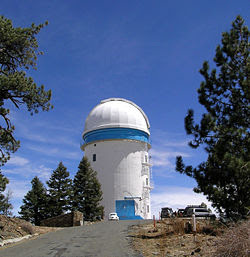 He presented his project twice more, and, in 1907, it was approved by the president of Mexico. In order for the project to be realized, numerous scholars were sent to Europe to study the mechanics of education there. Therefore, the education system in the UNAM, is more similar to traditional European system, rather than American one.And it was in 1910, during the Independence centennial, that the University was founded. As originally intended, the University enclosed all the major schools of Mexico under one name, and its original location was in the historic center of Mexico. Discussion took place in 1929 over the ruling of the university, and it was this year that it was declared an autonomous state organism. In 1950, the first stone of Ciudad Universitaria was set, and in 1954 it was finished and opened for the first time. 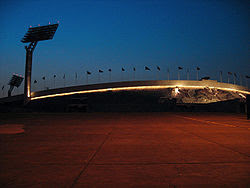 In 1968, the Olympics were held in Mexico, and the main venue was the UNAM's Olympic Stadium. 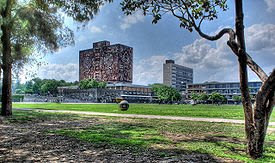 The events were overshadowed by the Tlatelolco massacre, which remains an issue for the university's activist students, that each year October 2 held demonstrations in the Campus, and this issue was part of the spirit of the most recent student strike in 1999. During the 1970s and 1980's the National Preparatory Schools (nine at the time) moved their locations from the center of Mexico City to satellite locations, in order to decentralize UNAM. Other campuses were built all around the city. UNAM recognizes two different types of university schools: Faculties and National Schools. Faculties are the only institutions that have postgraduate studies. Currently, most of the schools, either inside or outside the University City, had this title. A National School is an institution that cannot offer all postgraduate studies (Master's degrees and Doctorates). This is the case of the National School of Music, the National School of Arts, the National School of Nursery and Obstetrics, and the National School of Social Work.